The Engel G301 receiver is sold in Europe as a domestic wireless video sender receiver operating on 4 fixed frequencies in the 2.4GHz band. This modification is based on information found on N0QBH (Mike Berg) home page http://www.ringolake.com/pic_proj/wavecom/wavecom_rx.html were he describes a modification to the popular Wavecom JR receiver that can be bought in the USA. The modification to the Engel G301 is very similar however the main PCB has a different layout and also the IF is 479 MHz so Mikes software has to be modified slightly to account for the 479 MHz IF. 1. Before you begin test that your receiver works 100% before the modification. 2. Open up the receiver by removing the four screws on the underside of the unit. One screw is under a sticker "Warranty VOID if Broken" remove this sticker to find the screw and remove it. You should then be able to open the case. 3. Remove the main PCB from the case and on the under side of the PCB find the microprocessor shown in the photo below and with the use of a small soldering iron lift pin 8 and pin 9 from the PCB so they are floating in free air. 4. Then make the following four connections to the under side of the PCB using four insulated wires about 300mm long. Feed these wires through the holes in the PCB so they come out on the top side. These can be cut shorter later when you connect them to the socket of the PIC16F628. 5. The Main PCB can now be placed back into the bottom half of the case. 6. Looking at the bottom right hand corner of the main PCB you will see a small space were you can fit the socket for the PIC16F628. I have used a small piece of Velcro stuck to the PCB and another on the top of PIC16F628 to secure it. 7. Now get your 18 pin IC socket without the PIC16F628 installed and place it upside down were the Velcro is. This will allow you to position the four wires that you soldered onto the bottom of the PCB tidily across the top of the PCB to the socket. 8. Here is the schematic drawing of the connections. 9. Make the connections SCL, SDA, +5v and GND to the 18 pin IC socket. Also solder the two 47k resistors and 0.1uf capacitor to the IC sockets corresponding pins on the socket. 10. Now you need to cut a rectangle 72mm x 27mm in the top cover so that you can fit your mini 16 x 1 LCD display. Make sure you buy a 16 x 1 display whose PCB dimensions are no bigger than 80mm x 36mm otherwise you will have problems fitting it into the case. The display can be secured into the case by a small amount of glue. 11. Now drill the top cover for the two push buttons that allow you to change the frequency up or down. But make sure you have enough clearance under the switch connections so that when the top and bottom are closed that they don't touch anything on the inside. 12. You can now wire the LCD module to the socket for the PIC16F628. I used ribbon cable from an old hard disk cable. Below you can see the layout of the wiring. The power supply for the LDC is taken from the same 5v and 0v connections on the underside of the main PCB. 13. All that is needed now is to program a PIC16F628. 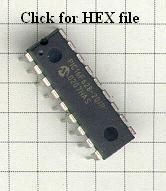 Just click on the image below to download the HEX file. Then plug in the PIC16F628 and close the case and refit just two of the screws as the new LCD doesn't allow you to reuse the two screws near the LCD. Many thanks to Mike Berg N0QBH for his original Wavecom Jr modification which inspired me to hack around with my own Engel G301 RX. Testing and using the modified Engel G301. 1. Power up the receiver and make sure the LCD displays 2300.00 MHz. 4. Turn the receiver off. Now power on the receiver but as it's powered up hold the frequency change UP or DOWN button and the receiver should switch to the narrow band mode. The display will now show 2400.00 MHz and should tune to 2500.00 MHz. 5. If you press either the frequency change UP or DOWN button for longer than 3 seconds, the receiver will start scanning UP or DOWN the band in 4MHz steps. To stop the scan just press the opposite button and make individual pushed on either button to fine tune the desired signal. 6. If like me you have the matching transmitter Engel G201, then channel 1 is 2433.50 MHz and you should be able to select channel 1 on the transmitter and set the receiver to 2433.50 MHz and you should be able to monitor your own transmitter to prove it's all working. Mike Berg N0QBH has also modified his Wavecom TX unit using the same VFO, In the near future I plan to do the same using my Engel G201 transmitter. I will update this page once it's completed (Possibly September 2003 due to holidays and it's to warm in the shack in the summer). If you want to modify a Wavecom Jr receiver here are the links to N0QBH website. Once converted, here are some frequencies for you to try.